Well, some sort of cowboy film has cropped up on BBC Two now signalling the end of our Formula 1 coverage and also our time to mosey on out of here. Andrew Benson's report from Friday practice and we will back tomorrow with coverage of third practice and then qualifying at 09:30 BST. Kayleigh Gray: McLaren not holding up the bottom of the table for FP feels like a podium finish. Fingers crossed for a good day tomorrow! If there is anything I have learned from football, Kayleigh, it is that golden boots make you awesome. "This is the problem with Kimi," says David Coulthard, right when Kimi Raikkonen walks behind him. Elliot Clough: "Its good to know Jules' legacy is to save his team in a wonderful drive at Monaco." Max Baggins-Craig: "A great man gone way too soon, you will always be in our thoughts & helmets. Also a word out to Schumacher & family/friend." "What is reassuring for Red Bull after a fairly lacklustre start to the season Daniil Kvyat is really starting to show his form. We know Daniel Ricciardo is a quality driver, he won here last year so they have the strength on the driving side. The chassis is working well round this circuit, just the engine that is not performing." Lewis Hamilton is the most successful current driver at Hungaroring with four wins to his name and he is looking good for a fifth after dominating both practice sessions. There is something a little different about the timesheet at the end of FP2, however, with the two Red Bulls second and third fastest. A dark horse for the weekend? 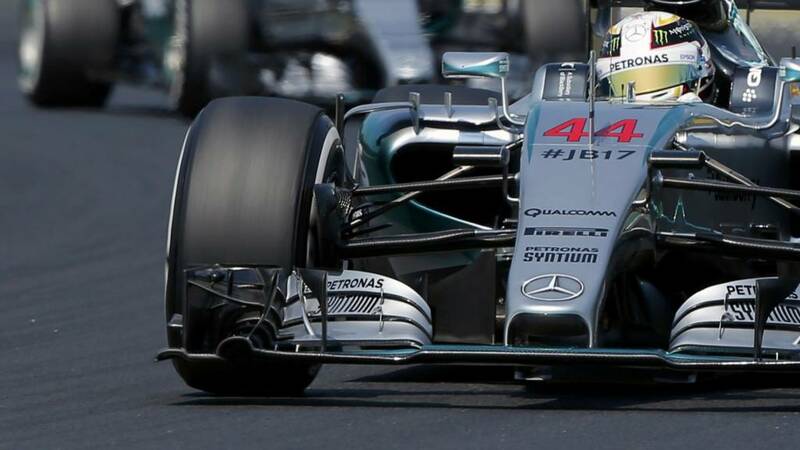 Lewis Hamilton finishes fastest in second practice for the Hungarian Grand Prix. Chrispy: Two spins in one session for Vettel - the Ferrari driver they said this week just "doesn't make mistakes". Natalie Hoffman: Enjoying #FP2 in bed. Yes, in bed. Lol just don't feel like getting up yet, why not have a lazy day?! Nico Rosberg and Lewis Hamilton both made the switch from the soft tyres for mediums. It is going to be Hamilton's day with just over three minutes to go. Mercedes: "Box, box, box!!!" Might it be for a set of these? Eight minutes left and Lewis Hamilton continues to lead the way with the 1:23.949 he clocked earlier in the session. Daniil Kvyat has the second fastest time, with Daniel Ricciardo holding third and Nico Rosberg fourth. Sebastian Vettel has had a bit of trouble getting to grips with his Ferrari on this circuit as he spins again, this time at Turn One. He doesn't seem best pleased with his set up, having made a few tweaks throughout today. Daniel Ricciardo: "It would have been nice to finish the session but the time we were out there was positive. I won't get too excited but looking at our competitiveness today we look to be back on the right track." It was not a long delay and the circuit is green again with just under 15 minutes to go. Daniel Ricciardo, you absolute trooper. His session might be over but he still manages to sport a trademark beaming smile as he is whisked away in what can only be described as "a clown car". I think I'd have preferred to have walked back. It was almost a double blow for Red Bull as Christian Horner tells Ben Edwards that leaking oil from Daniel Ricciardo's car almost took out Daniil Kvyat's Red Bull. Red flag as Daniel Ricciardo's Red Bull mimics a Red Arrow as white smoke plumes out of the back. The engine looks to have gone kaput and he parks up off the circuit. Despite that little spin, or dance as Lotus put it, Romain Grosjean is doing OK on the ageing softs. He has 14 laps under his belt on the tyres and is running consistently in the high 1:20s. "The front of the tyres suddenly load up and the rear does not have the load to cope with it and it is like a pendulum effect. That's two drivers who have spun into the slow speed corners." A brief flutter of the yellow flags as Romain Grosjean spins at Turn 13. No drama as he recovers and gets back on his way again. He currently has the 14th fastest time, with just under 30 minutes remaining. Bernie Austin: The thought of Red Bull with a Merc engine. Is exciting. It has the potential of dominating. Not sure Toto Woolf will agree. Shuffle: Can we get James and Alan going Oooooooooo in shock as a ringtone? As Kimi Raikkonen heads out on the medium tyres, Pirelli report that the performance gap between softs and mediums is in the region of 1.8 seconds. All quiet at Hungaroring again, with just Roberto Merhi and Carlos Sainz out on the circuit. There's a hairy wobble for Merhi as he has a big moment of oversteer. He almost loses the rear but keeps it together and continues on his way. Tank slapper-tastic. So far so good for Red Bull as Daniel Ricciardo, winner in Hungary last year, moves up behind his team-mate Daniil Kvyat and into third. Very little between the two, with his time of 1:24.451 a tenth of a second slower than Kvyat's time. "The pace of Red Bull this weekend will give Adrian Newey lots to smile about. You need consistent downforce on this track. It has not been the car that has been the problem this year, it has been the engine. They have reintroduced the blown front axle which helps increase the levels of downforce. It is very draggy, which is why it was taken off the car after Bahrain but here at this circuit, there is not so much drag." Sebastian Vettel spins, bringing out the yellow flags. He lost the rear of his Ferrari at the apex but manages to roll out of the way of other cars before rejoining. Yes he can! Lewis Hamilton moves back into first place with a 1:23.949, seven tenths faster than Nico Rosberg. Meanwhile, Daniil Kvyat is flying and he storms into P2, 0.351s off Hamilton's time. Nico Rosberg tops the timesheet with a 1:24.668, with Kimi Raikonnen second, Carlos Sainz third and Felipe Massa fourth but Lewis Hamilton is on his first flyer on the softs. Can he regain P1? Nico Rosberg rejoins the circuit on the soft tyre, as does his Mercedes team-mate Lewis Hamilton, Carlos Sainz, Romain Grosjean and Pastor Maldonado. Kimi Raikkonen's first run on these tyres seems him post a 1:25.134 - 2.4s faster than his best effort on the medium compound - and puts him into P1 for now. Scrap that, Kimi Raikkonen heads out on to the empty circuit and is the first driver to take on the soft compound tyres to start his qualifying simulation run. Closing in on the 30-minute mark and everyone is back in the pits. Nico Rosberg completes an eight-lap run before returning to the pits, his best effort - a 1:26.168 - had him second to Lewis Hamilton before Daniel Ricciardo rattled off a 1:26.023 to split the Mercedes. "I am at Williams and Felipe Massa, because he is behind his team-mate in the championship, is having to use the old front wing. The new one has an extra element in it and it is doing exactly what it is meant to be doing. There is direct correlation with the downforce shown in the wind tunnel and on the track. All these little increments will take them to victory lane. Massa will have this wing at the next race at Spa and it will help push them forward." We might not be racing, but Nico Rosberg tries to have a little nibble at Pastor Maldonado, attempting to sneak in on the inside of the Venezuelan. Maldonado defends, forcing Rosberg to back off. Williams are in no rush to send their drivers out, with Red Bull only just making their first appearance of the afternoon as Daniil Kvyat makes his way on to the circuit. His first timed effort of the session sees him slot in second fastest, a shade under two tenths of a second off Lewis Hamilton's best. Marcus Ericsson: "No grip, it's sliding everywhere." Just under 15 minutes in and Lewis Hamilton takes his place at the top of the timesheet as he posts a 1:26.132, over a second faster than Sebastian Vettel in second. Kimi Raikkonen is third, with Carlos Sainz fourth. "Force India have these large screens up blocking our view so we can't see Sergio Perez's car but we can see Nico Hulkenburg's and it is also problematic. The rear does not have the rear wing on it, they are going to put the race engine in ready for tomorrow which means no more running today. "Disappointing and costly as well, they suspect around £200,000 worth of damage to Sergio's car." Roberto Merhi is back in the Manor after Fabio Leimer was given a run out in the morning and he sets the early pace with a 1:32.790. Will Stevens then goes almost 1.5s faster, but I suspect it won't be long before they are bumped down the timesheet. Confirmation that Sergio Perez will not head out for second practice "at this stage" after his crash this morning, and neither will his team-mate Nico Hulkenberg. On comes the green light and out goes Will Stevens as second practice gets under way. They did not get much track time in first practice so Lotus will be looking to make the most of FP2. Romian Grosjean is suited up and ready and waiting for the track to open. Not long to wait Romain. "All year, the relationship between Red Bull and Renault has been marked by tension, with the team making clear their dissatisfaction at the performance of the engine. There are rumours at the moment about Red Bull wanting to end their relationship early and get a Mercedes or Ferrari engine as soon as next year. "In that context, Daniel Ricciardo was asked on Thursday whether he could sustain another year at the team's current engine level. He said: "Not the current one. A significantly better Renault I would accept, but as we are now, I don't think we could go with this performance again next year. Other teams will keep improving; we need a significant gain. With the rest, we'll see what happens. "He admitted being a customer team again was not an ideal solution: 'Now, we're down on power. If we were to go as a customer in the next few years, will a [supplier] let you win? Do you actually have an opportunity to win in the next few years? That's the big question.'" It is over 30C in Hungary now, with the track temperature creeping into the 50s. How do drivers cope with such heat? A blast of ice to the face, like Daniil Kvyat is getting here, seems to do the trick. Amazing to think that in 1986, when the Hungaroring was built, it cost £5m. Now you can't get a top footballer for much less than ten times that amount. Hungarian GP All You Need to Know. "This is an important session for Lotus, whose drivers managed only a few laps between them in the first 90 minutes. The problem was a lack of tyres until 15 minutes before the session - because Pirelli refused to release them until Lotus made their latest payment. "It takes an hour or so to warm the tyres up to working temperature in the blankets in the pits. Hence the problem. Pastor Maldonado and Romain Grosjean now have to do pretty much all their Friday preparation in one session." Fifteen minutes until second practice gets under way and there will be plenty of work to do for all the teams after a first practice session disrupted by two red flags - one for Sergio Perez's crash and one for when Kimi Raikkonen's front wing collapsed, leaving debris on the circuit. You'll be able to watch the session on BBC Two and online at 12:55 BST, with live commentary also on 5 live sports extra. There's also tributes being displayed by the fans in attendance at today's practice sessions. tweeted this picture of his car. "With us this weekend! Let's go for practice and qualifying tomorrow," he said. Formula 1 drivers are carrying tributes to Jules Bianchi on their cars or helmets this weekend, and there will be a minute's silence ahead of Sunday's race. We've also been asking for you to send in your tributes to #bbcf1, or to post them on the BBC Sport Facebook page. highlights of FP1 online if you want a quick catch up before second practice gets under way. "Force India say it's "looking unlikely" that Sergio Perez will get out in P2. 'There was a lot of damage and a lot of parts to change,' the team says." A win for Lewis Hamilton or Nico Rosberg in Hungary might deal a psychological blow to their title rival, but the loser might console themselves by looking in the history books. No driver has won at Hungary and then gone on to win the title since Michael Schumacher triumphed back in 2004. "If there was hope that someone might threaten Mercedes in the heat of Hungary - as Ferrari did in Malaysia back in March - it does not look very likely now. Lewis Hamilton and Nico Rosberg dominated the first session. "Hamilton was highly impressive in the first part of the session, lapping at first two seconds clear of anyone else - and still a second clear after Rosberg's second run. "The German closed to just over 0.1secs by the end of the session. But it looks already as if Rosberg will have his work cut out this weekend." It was a dramatic first practice session in Hungary this morning as Lewis Hamilton went fastest while Sergio Perez flipped. Right, time for a bit of lunch (or maybe it should be brunch?) but we will be back with live coverage of second practice at 12:30 BST. That was one of the strangest practice sessions I have seen in some time, with Sergio Perez's unusual crash and then Kimi Raikonnen's front wing dropping off. The two red flags means there will be plenty of work to do for the teams in FP2, which gets under way at 13:00 BST. "A bizarre session with some incidents we were not expecting but no surprises at the top with a Mercedes one-two." Lewis Hamilton finishes fastest in first practice for the Hungarian Grand Prix. Yes they do, Daniel Ricciardo gobbles up the chance for a few more seconds on the circuit. Green light on with 50 seconds left. Anyone fancy popping out? That could well be that. The marshals are out to sweep up the debris but with minutes left there is unlikely to be time for anyone to do anything more in this session. Frustration for Kimi Raikonnen as he runs on to the kerb at Turn 12, causing his entire front wing to inexplicably drop off, Raikkonen drives over it and punctures his tyre. "I don't know what happened, I lost a piece of front wing," observes Raikkonen. As ever, nothing but a hair's breadth between Lewis Hamilton and Nico Rosberg. The current world champion slices one tenth of a second off his benchmark time, clocking 1:25.141 before Rosberg also improves and is just 0.109s off the pace of his Mercedes' team-mate with his latest effort. Sauber: Both are off for the last laps in. Pastor Maldonado is out now but is struggling with a lack of grip as he battles to keep the Lotus on track through corners. All a bit "thrupenny bit", as Ben Edwards puts it. Will Lotus get some laps under their belt in this final segment? There's been plenty of thumb-twiddling for Joylon Palmer and Pastor Maldonado, whose only appearance on the circuit was to complete installation laps. Debutant Fabio Leimer has got a solid 14 laps in the Manor and has the 18th fastest time at the moment. James Rowe: It's clear that Sergio hasn't spoken to the team. Oblivious to the suspension failure and what actually caused the roll. The track is green again and out stream the cars for the final 15 minutes of this practice session. Lee McKenzie grabs a word with Sergio Perez, who confirms he is OK before talking through what he thinks happened. "The track is so dirty at the moment and I lost the rear of the car and went into the wall," he says. "I don't think there was suspension failure. The car crash collided at a very difficult angle which made it roll over. "The car looked quite bad. Hopefully we can do a bit of FP2." Sergio Perez is strolling back from the medical centre after being checked over. He looks a little shaken, but lifts his hand to wave to the crowd as they cheer him as he walks by. Meanwhile, his stricken car has been removed from the circuit, the marshals have swept up the debris and FP1 should be back under way shortly. "I've just seen a replay of the crash and it looks like the right front tyre digs in, which caused it to flip. When you run over the exit kerbs you get lot of vibration through the suspension and it looks like it was at that point when the right rear suspension failed and pitched him to the barrier." "I think Sergio Perez will be automatically taken off to the medical centre because it will have been registered as a big impact, even if he is up and walking about, apparently uninjured." Perez's crash happened at Turn 11, with the car sparking when he rode on to the kerb. The right rear suddenly gives out and sets him off skidding into the barrier. Sergio Perez crashes heavily, his car flipping upside down after skidding into the barrier, and the session is red flagged. He is quick to say he is OK on the radio thankfully. Everyone bar the two Lotus' - who have not been out since their installation laps - are on the track at the moment as Felipe Nasr has a moment at Turn One, locking up but keeps it together to regain control and continue without bother. Jenson Button knows how to win in Hungary, having done so in 2011 and in 2006, when he came through the field to win from 14th. Alonso is currently 10th fastest, with Button down in 16th. SB Walch: Jules will be remembered along with the greats of F1. Talented driver - he will be missed. The Banter Sponge: My favourite memory of Jules was the P9 at Monaco, especially when he got back into the pits and how much it meant to Marussia. The current track temperature is not quite as hot as yesterday as it creeps up to a feet-hopping 42 degrees C. Felipe Nasr breaks the silence over Hungaroring as he fires up the Sauber and heads back out on to the circuit. It looks like it is going to be a scorcher of a weekend in Hungary, with track temperature a tarmac melting 59 degrees on Thursday. Yowzer. The live streams of FP1 are now fixed and up and running so you can watch the remaining 47 minutes right now. Don't forget you can also view the extra camera streams during practice these days, including pit-lane feed, driver tracker and on-board. All quiet on the circuit at the moment with cars being prepped for their second runs. With this being the last race before the summer break, there will be plenty of drivers further down the field keen to put on a good show this weekend and strengthen their chances of securing a seat somewhere next season. "Who will come out on top in the battle for best of the rest behind Mercedes? Although Sebastian Vettel ended up on the podium at the British Grand Prix, Ferrari had an off weekend at Silverstone, unable to keep pace with Williams, and it took an inspired strategic call and Williams's poor pace in the rain to elevate the German. That could indicate a difficult weekend for Ferrari. On the other hand, their car is good in the heat. "Williams struggle for low-speed downforce - just look at their lamentable performance in Monaco - but have made improvements since then and Valtteri Bottas pointed out that he qualified third last year in Hungary. "And there's Red Bull, for whom the power deficit of the Renault engine is punished less in Hungary than at most other tracks. 'We'll start the weekend aiming for a top five and see if we can improve on that,' Daniel Ricciardo said." These are the latest top 10 times as we pass the hour mark. 1. Lewis Hamilton (1.25.291) 2. Nico Rosberg (1:26.221) 3. Daniel Ricciardo (1:26.350) 4. Kimi Raikkonen (1:26.439) 5. Max Verstappen (1.27.329) 6. Carlos Sainz (1:27.344) 7. Fernando Alonso (1:27.526) 8. Valtteri Bottas (1:27.737) 9. Felipe Nasr (1:27.749) 10. Sergio Perez (1:28.003). Tuhairwe Herman: Jules Bianchi was the future of F1. Even in coma, his resolve to always fight on was the embodiment of the F1 spirit. Jolyon Palmer is pencilled in to make his regular FP1 outing this morning, although he has yet to appear on track in the Lotus. "We had a small issue with tyres this morning but it is all sorted now," he tells BBC Sport. "I should be out any second." In case you are wondering why you can't watch the TV coverage of first practice online it is because we are having a few technical issues with the live streams and live leaderboard. That means, sadly, you are stuck with my words for now. We hope to get it fixed as soon as possible. at Wimbledon earlier this month? This picture of the Mercedes man with Sylvester Stallone, taken at the Leonardo DiCaprio gala in St Tropez earlier this week, would suggest not. "Yet again, Lewis Hamilton has come out of the blocks flying at a grand prix. Twenty minutes into first practice, Hamilton is two seconds clear of the field. "He just gets to the limit so much quicker than most; which is as function of natural talent. It has become a bit of trend this year, but it is no less impressive for it. "Nico Rosberg has just gone quicker at the start of his second run - but is still a second off his team-mate." Nico Rosberg is not alone in not being completely happy with things in his Mercedes as Lewis Hamilton complains of a buzzing noise, "sort of like a bee," he says. It has not stopped him from going top of the timesheet with a 1:26.286 - half a second slower than his pacesetting time in FP1 last year. Hamilton is one of nine drivers to clock a timed effort with this session 20 minutes old. "There was an interesting bit of mind games between the Mercedes drivers in their Thursday afternoon news conferences. "Nico Rosberg spent some time - a little reluctantly, admittedly - talking about a problem with the general braking of the Mercedes which is 'something I don't like and would prefer to be different' but which is proving difficult to solve. "Hamilton was inevitably asked about the issue and responded: 'He was perfectly fine on the brakes in the last race. I'm just letting you know, and he knows you're going to ask me that! We don't have any problems with the brakes.' All part of the fun of the fair." Just over 10 minutes into FP1 and we have our first timed lap, Nico Rosberg posting a 1:29.215. He complains of "a lot of oversteer" after completing the lap, however. There is a new name taking part in first practice today, as Fabio Leimer makes his Manor debut. The 26-year-old Swiss was the 2013 GP2 champion and joined the team as an official reserve driver last month ahead of the Canadian Grand Prix. He has just popped out for his installation lap. "Out on track, this weekend marks the halfway mark of the two-way all-Mercedes shoot-out for the title. Lewis Hamilton leads Nico Rosberg by 17 points heading into a weekend on a track on which the world champion has always excelled. "Rosberg points out that '17 points is much less than a single race and we know anything can happen in F1', but does admit that 'it is important to turn it around ASAP'. "Rosberg says he is unconcerned about Hamilton's record at Hungary - four wins in eight years - because 'I've shown in the last two years or so that if I get my weekend together I can be on pole and win.'" Brilliant blue skies above Hungaroring as on comes the green light to signal the start of first practice, Nico Hulkenberg is the first driver to roll out on to the circuit. At 25, Jules Bianchi's life was tragically cut short. He had looked destined for a hugely promising career in Formula 1. We'd like to provide you with the opportunity to send in your own tributes to Jules Bianchi, send them to #bbcf1 on Twitter, text in on 81111 or you can post them on the BBC Sport Facebook page. The Hungarian Grand Prix is live on BBC TV and radio across the whole weekend, with first practice coverage getting under way RIGHT NOW on BBC Two and Radio 5 live. Here's our coverage details for the whole of the day. "Any life lost young is a tragedy, and Jules Bianchi's is no exception. His death has hit Formula 1 hard, and refocused minds on the inescapable truth that, along with the drama, glamour and thrill of the sport, comes a risk that can never be entirely removed. Bianchi left us before he had a chance to prove exactly how good he was, but you don't have to look very far to see his profound legacy. "For one, he will be remembered as an 'excellent driver', as no less a figure than Fernando Alonso put it. Then there's the fact that as Valtteri Bottas said: 'He was just a nice guy everyone liked.' There are the safety improvements that followed his accident. And finally, without the two points Bianchi scored with his attacking, incisive drive in Monaco in 2014, Marussia would not have been considered worth saving by its new owner. "Without Bianchi, in other words, there would no longer be a Manor F1, a debt acknowledged by their new driver Will Stevens: 'The difference Jules made last year in Monaco is absolutely key to us still being here.' None of that makes the loss any easier to bear, but it is at least something to weigh against the grief." Three weeks after Lewis Hamilton won the British GP to extend his lead over Nico Rosberg to 17 points, we are back for the final race before the summer break. This will be the chance for Hamilton to head into the mid-season shutdown with a healthy advantage at the top of championship, or for Rosberg to close the gap and really crank up the pressure. There is, of course, much more on their minds of the drivers than what is at stake in the title race. "Jules will be in all of our thoughts this weekend in Hungary," Hamilton says. "But we will go out and race hard for him because, like him, we are all racers. That's what we do, what Jules did, and what he would want us to do." Read more from Hamilton in his latest column. "For many, it is hard to comprehend how grand prix drivers can get back into their cars and risk their lives anew just three days after attending the funeral of one of their colleagues. But they see life in a different way from most of us. "Red Bull's Daniil Kvyat, whose flat, Russian-accented English belies an intelligent man who speaks five languages and reads Ernest Hemingway, explained it as well as anyone: 'The last few days were very hard and the racing is the best therapy. Once we close the visor we will distract ourselves but obviously we will never forget. Jules will always be in our hearts and minds. For those of us who were there to say our last goodbye, it was a very sad day. "Lotus's Romain Grosjean, who had known Bianchi for more than a decade and was among the pall bearers at the funeral, added: "We know it's a dangerous sport but I think that was a hard way to remember that. But when the helmet is on and visor is closed, it's racing 100%. That's what we've always been doing and that's what racing drivers will always do.'" Just days after attending the funeral of Jules Bianchi, Formula 1 drivers gather again for this weekend's Hungarian Grand Prix. The paddock will be its usual, bustling self as drivers and F1 personnel go about preparing for the race - as they should - but their thoughts will undoubtedly be on Bianchi. The Marussia driver died last Friday, nine months after suffering severe head injuries in a crash at the 2014 Japanese Grand Prix. Teams and drivers are planning tributes for across the weekend to honour the memory of their colleague.